I've had my Microsoft Surface RT for about 4 months now and I have so say that it's my "go to" tablet these days. It doesn't have as many games as the iPad or Nexus 7 or as polished of an OS but it does have something both of those devices don't.....a full internet experience. Because of the fact that I can get to any website and get the full desktop experience, I have taken my Surface to work with me almost daily. As most people know, the Surface comes with two keyboard options. the Touch and Type keyboards. I purchased my Surface with the touch and ended up buying the Type soon after. I prefer the Type if I anticipate I will have a lot of notes to take. But if I know I will just be watching basketball or browsing random websites, I'll take the touch keyboard. The last 3 or 4 months I have seen an extreme influx of integrated keyboards for the iPad and iPad Mini. Logitech and Belkin have lead the way with quality keyboards but many other companies have created their own Bluetooth keyboard/case products as well. I see these bulky products and notice how thick they make the iPad look and feel. The video at the top is Logitech's latest version of an integrated BT keyboard and case. 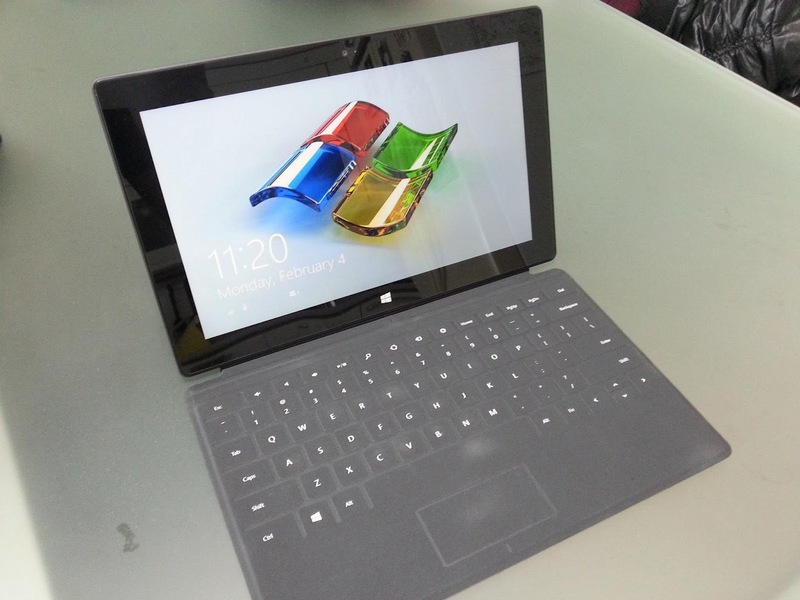 I look at that thing and think, "This is twice the size of the Touch or Type keyboard for the Surface." I'm not saying that in a bad way but if you are carrying an iPad for portability, why hinder that with a thick case? Those that might know me personally may note a recent Facebook post about a guy who carried his iPad in what looked like a suitcase and a woman who used her iPad mini but paired that with a full size Apple keyboard. Why be "mobile" by carrying these tablets yet hinder them by cases or devices that make you carry more than what would be a full size laptop? Microsoft, got it right when they made the Touch and Type keyboards. The Touch is good enough to accomplish most tasks that are short of writing a college term paper less than 500 words. And the Type cover fills that role of extensive typing while adding very little bulk when compared to the Touch keyboard. There's no extra cases, cumbersome setups, or bulky feel when using these keyboards. They both attach really easy and are a joy to use. The Touch keyboard adds maybe 2-3mm to the size of the Surface and the Type adds maybe 4-5mm. Both keyboards cover the screen while stored and provide an excellent typing solution when deployed. I applaud both Belkin and Logitech for their efforts in making an integrated Bluetooth keyboard solution for the iPad and iPad Mini. They to push out really great devices that serve their purposes well. But in the end of the day, if you require a keyboard for your tablet, you probably need it for productivity. And if you need your tablet for productivity, the Surface beats the iPad and any Android tablet/keyboard solution 8 days per week. If you're going to attach a keyboard/case solution, why not choose the device that does it the best? I didn't mention the price of this Logitech folio keyboard. This thing costs $150. So if you purchase an 16GB iPad and then purchase this keyboard, you are going to pay about $650 which is $50 more than you would if you bought a surface with touch keyboard. The only advantage you would have is the Logitech case covers the back of the device. Yes, you can say app support but with a full internet experience, you can get to any website you want which negates a lot of the "app support" comments. Arguments will be like, "I have a Facebook app" and the reply to that is, "Uhm, I have Facebook. Like the real website Facebook." The iPad has more games but keep in mind you purchased this setup for productivity not gaming. So not only will it make your iPad bulkier, but it costs more and you will need extra cables to charge it. Don't get me wrong, the iPad is a great device. I've owned 3 of them now. But when considering a tablet as a productivity or content creation device, it simply doesn't measure up to what Microsoft has done with the Surface. The size, fit and finish, and ease of use all make the Surface the clear choice when considering a tablet meant for productivity.